For the last few weeks, I’ve been working feverishly on a new project with two other guys. Basically, the idea is to create 21-day email courses to learn something new, as well as the ability to track and share your progress. So let’s say you’ve always wanted to learn HTML, or French cooking, or how to play a song on guitar. You sign up and every day you get an email with a short lesson, you track your progress toward your goal with a single click, and your friends and family can see how you’re doing and offer you encouragement if you’re struggling. 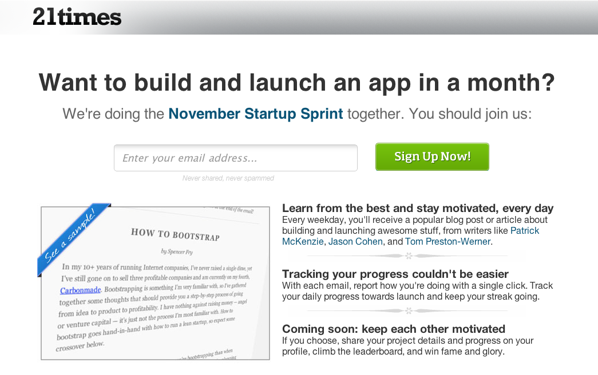 Pretty simple, but we were been looking for a place to test out the concept and we discovered that a bunch of Hacker News users were going to make November “launch-an-app” month. We thought this would be perfect, so we’ve obtained permission from some of the startup world’s best authors to let us use their content and we’ve created a 21-day email course on how to build and launch an app. Think of it as a how-to guide with a social version of the Seinfeld method tacked on to help you keep going and finish strong. So if you’ve been thinking about building something, do check it out: http://hn.21times.org. The course will be up starting today, so you can jump in and start whenever you want. But as with most things, the important part is to take that first step. Let me know if you have any questions or need help!